What is Fire Puja ? A Fire Puja is an offering of a large number of specific substances tossed into a fire during an elaborate ritual. 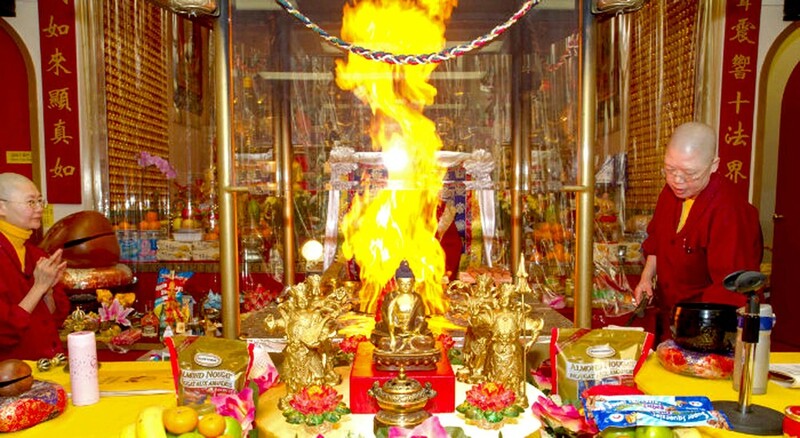 The Fire Puja burns off or purifies obstacles and bonds us more closely with the Buddha. The Fire Puja is very powerful and has many benefits. For the living, a Fire Puja ceremony fulfills wishes, removes obstacles, improves health, and increases merits. For Buddhist practitioners, it helps the practitioner gain accomplishments on the path, stabilize one's meditation concentration and improve one's spiritual practice. For the deceased, the ceremony is an excellent method of purifying negative karma and attaining higher rebirth. Even if you're not attending the Fire Puja in person, you can still participate by submitting your name and the names of any loved ones or friends, living or dead, whom you would wish to benefit from the puja. We will have the red and yellow dedication sheets used in the ceremony available at Ananda Dharma Center prior to the Fire Puja. If possible, please fill them out in advance. They will also be available on the day of the Purification. Please arrive 45 minutes early to fill out the sheets if you do it the day of event. Please see a staff member for sheets. It's important to note that one establishes a karmic link during the purification ceremony by offering something of value in the fire ritual (Eg: sponsoring the dedication sheets). While it is not required to make a donation, tradition holds that the practice is more effective if done in this manner. Any amount, small or large, is certainly welcome.